He said that Sri Lanka great 2500-year-old civilisation has been ruined by Prime Minister Wickremesinghe’s government which has reduced the country to begging. He said the alliance would rid Sri Lanka of evil foreign influences and stop outsiders from plundering the country’s wealth. 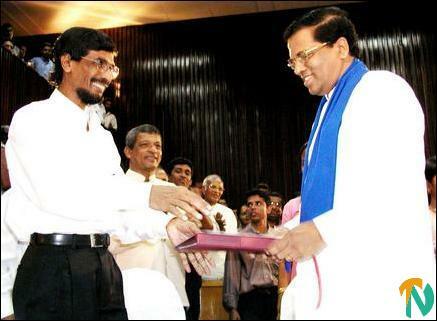 The agreement was signed at the Banadaranaike memorial International Hall in Colombo by SLFP General Secretary, Mr. Maithripala Sirisena and JVP Gen. Secy. Mr. Tilvin de Silva at the exact time determined as auspicious by astrologers. 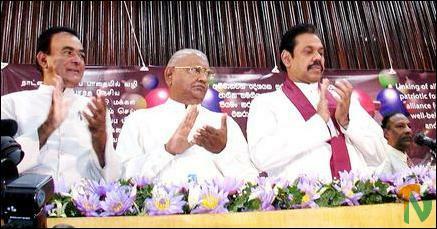 Opposition leader Mahinda Rajapaksha, President’s brother Anura Bandaranaike, former PA Prime Minister Mr. Ratnasiri Wickremanayaka, Mr. Lakshman Kadirgamar, Mr. Douglas Devananda, Ms. Ferial Ashraff and a large number of opposition politicians and supporters were present at the signing. Mr. Sirisena and Mr. Silva exchanging the signed copies of the MOU. The Alliance song composed by Mr. Kumaradasa Saputantri was sung before the signing. 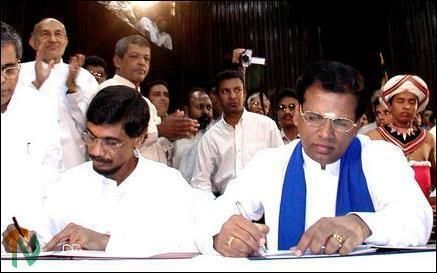 The main part of the agreement was read out in Sinhala after the signing and exchange of documents. Thereafter Mr. Maithripala Sirisena spoke on the historical and political background of the agreement. Mr. Tilvin Silva spoke after him.